Are you excited to watch upcoming Macy’s 4th of July fireworks celebration? Some of the popular artists will be performing at this year’s event. To celebrate Independence Day, Macy’s having a Sale too at their site. In support of Macy’s Sale event, savings.com are running a $1,000 Macy’s gift card giveaway. Enter contest below to win prizes. Starts Wednesday, June 28th at 12:00 AM ET to Tuesday, July 4th at 11:59 PM ET. Open to US, 18+years of age. The winners will be chosen through a lottery drawing and notified on Wednesday (7/5) via the email address used to enter. Disclaimer: Work Money Fun is not responsible for prize fulfillment. 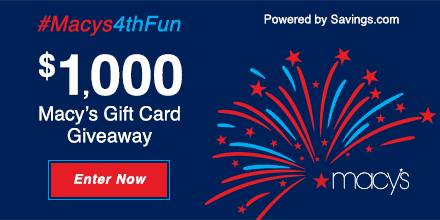 Sponsor is responsible for awarding prizes to winners of Macy’s 4th of July fireworks sweepstakes.